Hi, we are Andrew Taylor and Ben Liadsky from Taylor Newberry Consulting. We’d like to share with you our research on learning cultures and how grantmakers can build learning relationships with their grant recipients beginning at the grant application stage. Achieving Greater Impact by Starting with Learning explores strategies that grantmakers can use to promote a learning culture for themselves and their partners, thereby laying the groundwork for more meaningful evaluation. We know that evaluation is much more likely to lead to action when it is undertaken by an organization that has a strong culture of learning. This is especially true in the nonprofit world where traditional, linear evaluation models often can’t keep pace with the speed and complexity of change. However, building and maintaining a learning culture is a complex, nuanced process that takes time and effort. It requires a different set of skills than evaluation design. Given that organizational culture is the soil into which evaluators hope to plant seeds, it may be important for us to develop a deeper understanding of how learning culture works and what can be done to cultivate it. Conversations between grantmakers and grant recipients that focus on learning — if they happen at all — tend to take place too late in the relationship and might only show up as one question among many in a report somewhere along the way. 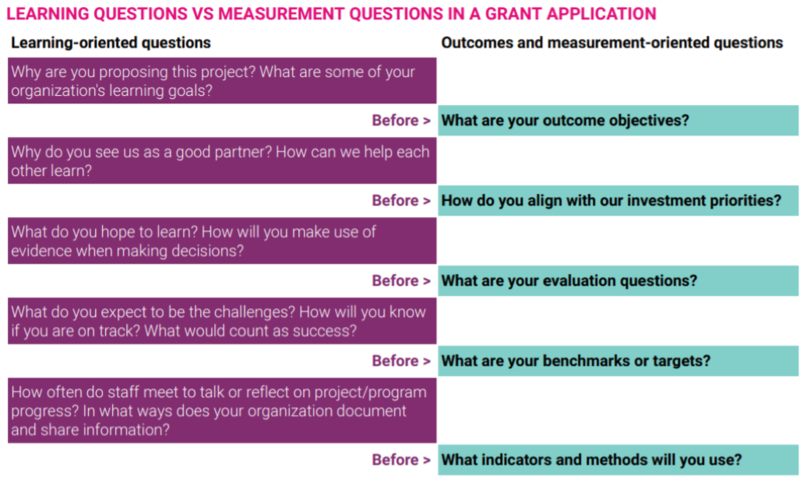 Typical grant application questions can lead nonprofits to conclude that measurement and accountability matter most. For instance, the teal-colored questions below are low risk, accountability focused, and transactional. If they get asked early in the conversation, they may set a tone for what is to follow. Shifting the focus to prioritize learning questions, those in purple (below), can change the conversation to one that is more open, fluid, and, potentially, more honest. Ideally, the grant application stage should be an entry point for the grant recipient and the grantmaker to begin a relationship that is more focused on learning. Ultimately, the types of questions that get asked and even the way in which they are asked can have implications for the type of information that a grantmaker expects will emerge. An emphasis on developing learning relationships early on can have great value for grantmakers as it may ultimately lead to supporting organizations that are highly effective. This in turn may lead to greater long-term success as both the grant recipient and the grantmaker learn together and share in their goals and development of next steps.